“So what exactly did the bailout accomplish? It built a banking system that discriminates against community banks, makes Too Big to Fail banks even Too Bigger to Failier, increases risk, discourages sound business lending and punishes savings by making it even easier and more profitable to chase high-yield investments than to compete for small depositors. 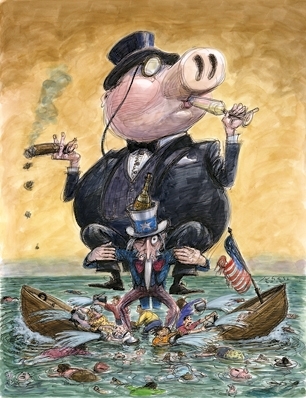 The bailout has also made lying on behalf of our biggest and most corrupt banks the official policy of the United States government. And if any one of those banks fails, it will cause another financial crisis, meaning we’re essentially wedded to that policy for the rest of eternity – or at least until the markets call our bluff, which could happen any minute now. This entry was posted in economy, finance, Quotations, Uncategorized, Wall Street and tagged bailout, banking system, Matt Taibbi, Rolling Stone, Secrets and Lies of the Bailout. Bookmark the permalink.